The next step in quantification requires you to extract edge intensities from spectrum, while you disregard the underlying background intensity. Which background model should I use? Where should I fit the background model to the data? What are the optimal width and position for the signal integration window? To extract the edge intensity, you must determine a model for the background of your spectrum. First identify a pre-edge fitting region that allows you to determine parameters of the fit. 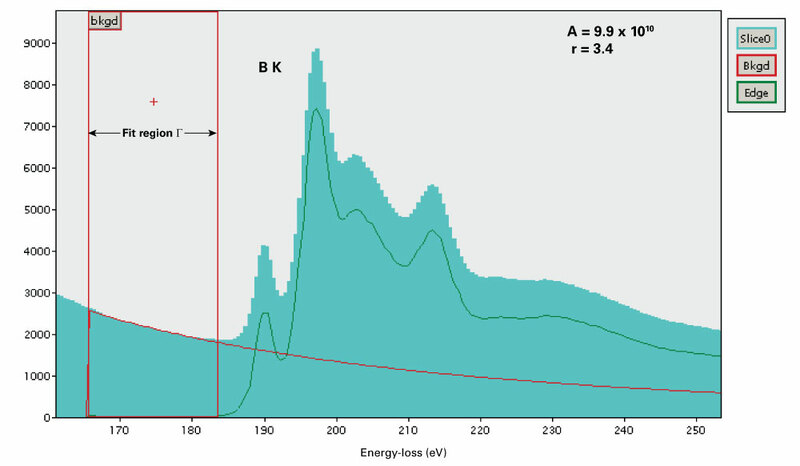 Then extrapolate this fit to estimate the background intensity below the edge signal. However, an accurate background subtraction may become difficult below 100 eV due to the large number of scattering processes in this region (e.g., plasmons tails, plural scattering). Typically, the model is determined using linear least-squares methods using a single pre-edge region \(\Gamma\). A power law is the most common background model. This model has the physical basis when interpreted as the long energy tails of the preceding energy loss events. Once background placement is made, it is important to review common errors. The background in this case changes rapidly as the window position is moved. A larger window and avoiding the edge onset region are recommended. With Gatan Microscopy Suite® (GMS) 3 software, the process of signal extraction is highly automated. However, the guidelines and concepts above still must be considered. GMS 3 quantification utilizes a model based approach where the spectral background and the edge intensity are treated as single model. If there are overlapping edges present, they are also added to the model to allow separation of the overlap. 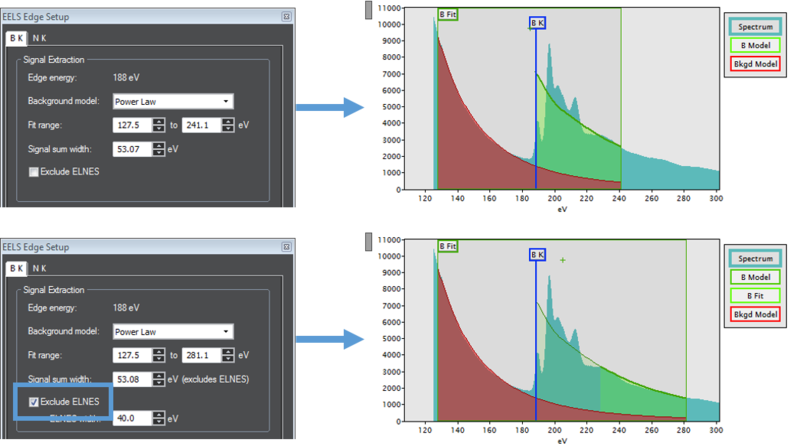 Follow the below steps for EELS signal extraction in GMS 3 software. 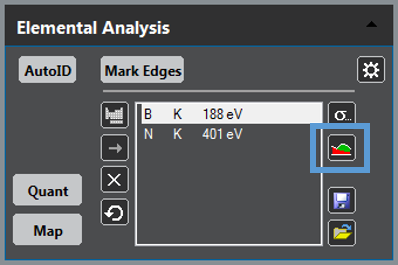 Show fit regions on spectrum using the Show signal setup button in the Elemental Analysis window. The edge model will be shown on the spectrum. Default values are typically adequate, but the regions of interest can be dynamically changed by the user if needed. Exclude ELNES allows the model to begin after a predetermined ELNES region. This leads to more consistent fitting to the calculated cross-section and should be used when fitting strong edges. For semi-quantitative mapping, the ELNES region should be included to get the best signal-to-noise (SNR) in the maps. 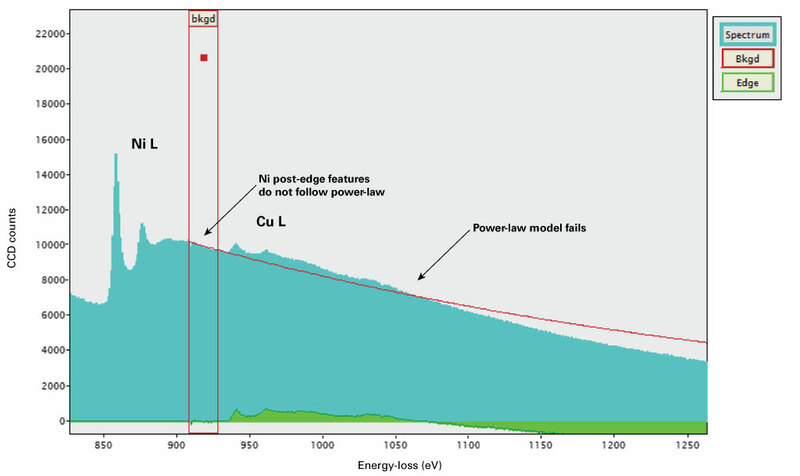 Edges that are close in energy are automatically tagged for overlap analysis. You can change this default using the Overlaps check box in the edge setup dialog. Overlapping edges are fit together as a single model. 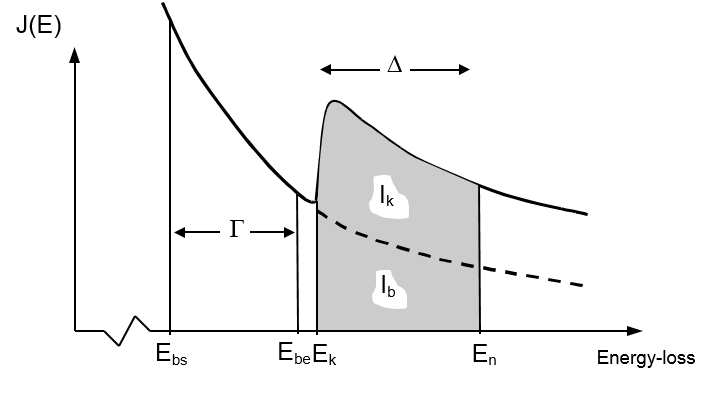 The total signal for the overlapped edge includes contribution from the preceding edge background. Joy, D.C.; Maher, D. M. The quantization of electron energy-loss spectra. J. Microsc. 124:37 – 48; 1981. Egerton, R. F. A revised expression for signal/noise ratio in EELS. Ultramicroscopy. 9:387 – 390; 1982. 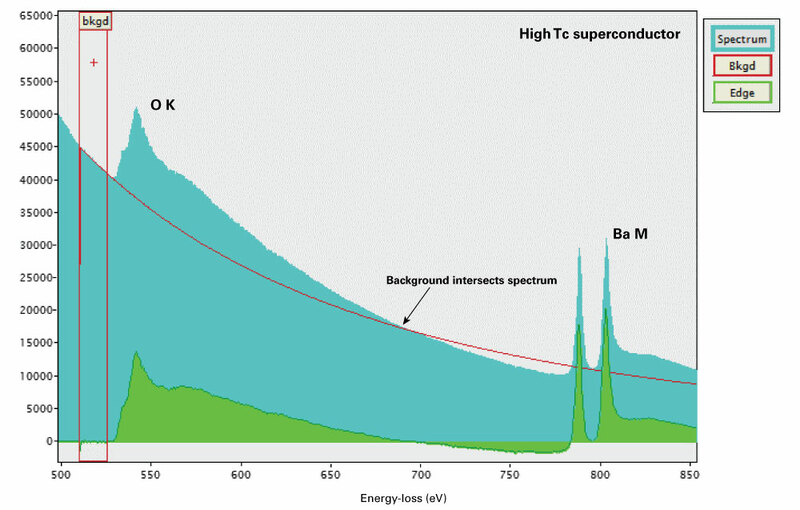 Leapman, R. D.; Swyt, C. R. Separation of overlapping core edges in electron energy loss spectra by multiple-least-squares fitting. Ultramicroscopy. 26:393 – 404; 1988. Kothleitner, G.; Hofer F. Optimisation of the signal to noise ratio in EFTEM elemental maps with regard to different ionisation edge types. Micron. 29349 – 357; 1998. Verbeeck, J., Van Aert, S. Model based quantification of EELS spectra. Ultramicroscopy. 101(2 – 4):207 – 24; 2004. Riegler, K.; Kothleitner, G. EELS detection limits revisited: Ruby – a case study. Ultramicroscopy. 110(8); 2010. Thomas, P.; Twesten, R. A Simple, Model Based Approach for Robust Quantification of EELS Spectra and Spectrum-Images. Microscopy and Microanalysis. 18(S2):968 – 969; 2012.